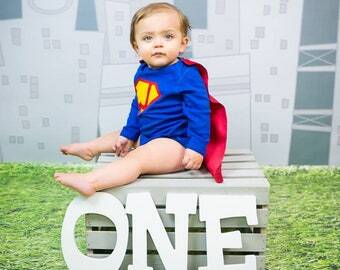 Having a Superhero themed 1st Birthday party? 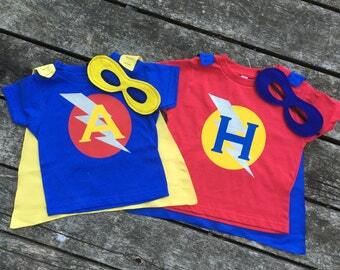 This Personalized Superhero Inspired Baby Outfit makes for a perfect First Birthday, or a great outfit for comfy everyday wear. This Birthday outfit comes with everything your little hero needs to save the day! 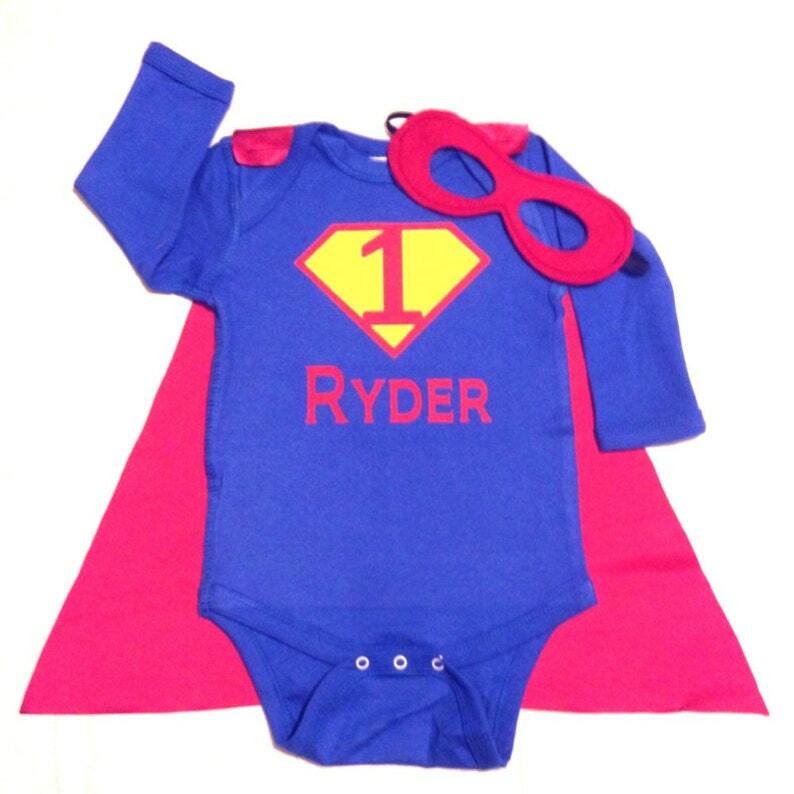 This listing features a Blue Superhero bodysuit (Personalized with your child's age and name) with matching red satin cape and coordinating reversible mask! Ultra soft velcro attaches/detaches cape on shoulders of bodysuit. Baby bodysuit can be worn alone, then quickly accessorized when duty calls. Reversible felt mask features two coordinating colors (Red/Blue), with elastic sewn securely into mask. I use earth friendly Eco-fi felt, which is made from recycled soda bottles. Available in Sizes: Newborn, 0-3 months, 3-6 months, 6-12 months, 18 months, 24 months. (These bodysuits run a little big. I do not recommend ordering the next size up.) Need a different number? No problem! Need a toddler or child's T-Shirt instead of a bodysuit? That's fine too! Just make sure you let us know in the Notes to Seller box when you order. Please Note: This logo is a transfer design which is applied with a professional grade heat press. Wash inside out, in cold water on a gentle cycle, tumble dry low heat to best maintain the quality of logo. Please write your Name and Number choice for Free personalization in the Notes to Seller box at checkout. Just what I was looking for! It was perfect for my NICU hero!